Sheep is a term for selective grazing animals that may be domesticated (tamed) or wild. This material will primarily focus on domesticated sheep. Behaviorally, sheep are gregarious, precocial, defenseless creatures. But what does that mean? Gregarious means that they flock together or like to be with a group. It is rare to see a sheep by itself because of their gregarious nature. Precocial means that they have a high degree of independence at birth. This means that they can stand on their feet shortly after birth. Sheep are defenseless for the most part against predators like coyotes and wild dogs. Sheep are also very selective in their grazing habits. Sheep have a split in their upper lip, with this they are able to pick the preferred leaves off of the plant. At one time all sheep were wild. Around 10,000 BC sheep were domesticated by the humans. Most of the wool breeds of sheep were developed from Moulfan sheep. Most of the hair breeds are similar to the Urial sheep of ancient times. Prior to domesticating sheep, the dog and reindeer were domesticated. As the animals were raised under tamed conditions, they went through several changes. On the outside the sheep began to develop more wool and less hair. The color of the wool and hair changed from brown and shades of brown to whites and blacks. Their ears became more of a lop ear than an erect ear. The horns that the wild sheep possessed were weakened and disappeared from many breeds. On the inside the sheep changed as well. These internal changes happened at both ends. The tails had less vertebrates, or bones than the sheep do now. Today's sheep also have a smaller brain than the sheep 12,000 years ago. Sheep were tamed for several uses that still apply today. The sheep were first used for meat, skins, milk and wool. Sheep are still used for these basic purposes plus many more. Sheep by-products are in many items that we use everyday. Birth weight 5 - 8 lb. Maturity (physiological) - Chronological age of the live lamb is determined by assessing the physiological age of the bone and muscle. 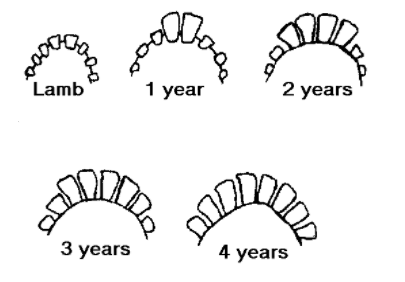 Maturity grades are A and B.
Sheep teeth diagram by year.